"Only Lisa Genova could bring such honesty and grace to the war against ALS. Searing writing and a must-read." "Lisa Genova writes with humor and humanity but also with a scientist’s eye about the daily depredations of disease, the incremental losses, the slower acceptances, the rage, the love, the courage, and strangely enough, the joy. A nocturne of the soul. Read this book, read it all night, and wake up glad to alive." —Bill Roorbach, author of Life Among Giants, The Remedy for Love, and The Girl of the Lake. "Lisa Genova’s brilliant Every Note Played stapled me to the couch. Written with vivid honesty about the realities of ALS, for both patient and family, this novel goes far beyond drama or education—though Genova provides both. The powerful compassion in this book placed it on that rare list: one of the books I’ll remember forever." "Sometimes it’s easier to tell truth in fiction. Lisa Genova has made a career of it... She tells the tale of a piano virtuoso whose body begins to slowly weaken and fail due to the devastating disease. And she tells it with heart and hope." "At turns beautiful and brutal, Lisa Genova crafts a realistic and heartrending portrayal of a couple’s failed marriage in the midst of the husband’s battle with ALS. The emotions and intimacy conveyed are difficult to read, but impossible to ignore." "Her juxtaposition of scientific detail with compassionate, heartfelt storytelling is unparalleled... [I]n true Genova fashion, Every Note Played is as full of hope as it is of heartbreak." "Somewhere Reese Witherspoon is learning how to pretend to play the piano, because I can easily see her starring in a film adaptation of this tug-on-the-heart-strings novel." "Genova expertly details the devastation ALS wreaks on Richard, and though her latest is a sometimes difficult read, she finds hope in the opportunities Richard has to repair his relationships with his daughter and brothers before it’s too late." 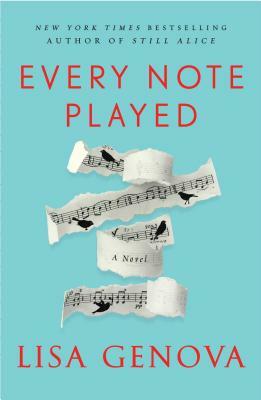 "What’s amazing about her newest novel, Every Note Played, is what is amazing about all of Genova’s books. She is both the neuroscientist and the actor when she writes. She tells not only the story of a person struck down by some disease. She tells the story of the disease, too. And you learn this way. But it never feels like learning." "An expertly written depiction of the toll a ravaging disease takes on both the body and the heart." "This book is especially remarkable because as a neuroscientist, author Lisa Genova has keen insight into the realities of ALS." "Genova expertly explores regret, guilt and forgiveness as we witness the progression of this deadly disease." "Genova unsparingly details the tragedy of ALS. But she includes the beauty and joy of Richard and Karina's lives in music, balancing the horrific with the uplifting. Every Note Played is the story of a marriage, as well as a hard-hitting primer on a disease."